Support our campaign to ask the Province to develop an increase in the EIA basic needs benefit as part of a comprehensive plan to address poverty. We want as many groups to sign on as possible, please let us know if your group would like to join us (current list of endorsing organizations). We are seeking your support for our campaign to ask the Province to take two concrete actions towards ending poverty in this year’s budget. Firstly, the Province should develop a comprehensive poverty reduction strategy in consultation with community members. Critically, this strategy must include targets and timelines for poverty reduction. If we do not have a vision for where we are going, we will never arrive at our goal. Secondly, the plan must include an immediate increase to the EIA basic needs budget of Manitobans living in the deepest poverty. Single individuals and persons with disabilities suffer the most, with respective incomes 47 and 32 per cent below the poverty line. We call on the Province to create a benefit that will raise the incomes of all Manitobans to at least 75 per cent of the the poverty line. Please contact me if you want more information about how to support the campaign. We would be pleased to meet with you or your board if want more information about the campaign. A representative of the campaign will be calling your organization within the next few weeks to answer any questions you have. Thanks for all your support. Together we can end poverty in Manitoba! 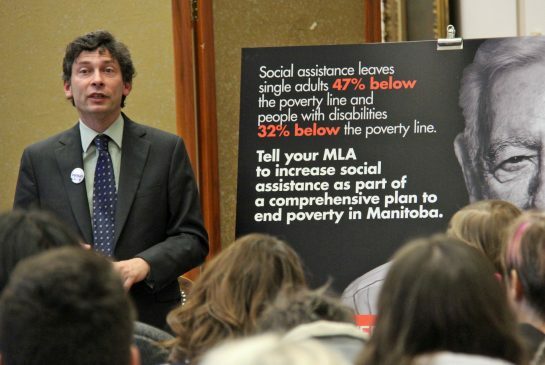 Canadian Centre for Policy Alternatives – Manitoba also published a Fast Facts about the campaign: Community looking for action plan from Province on povertyWe also did radio interviews on CBC, CJOB, ICI Radio-Canada and CKUW.